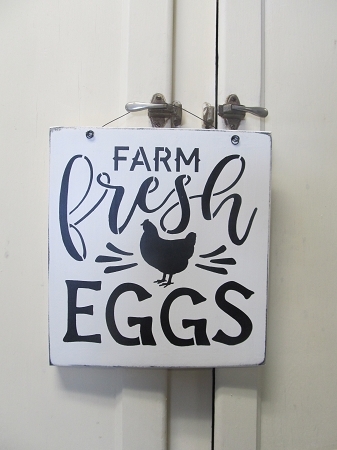 Farmhouse Rustic Farm Fresh Eggs Hand Painted Wood Sign. Love these New farmhouse style look. 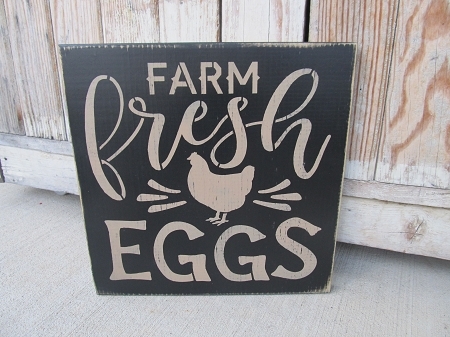 Love the graphics on this hand stenciled sign. Neutral color scheme that coordinates with the farmhouse decor. Colors can be changed around. Shown is the saying painted on in khaki tan on a black colored background. Size is 12" x12". Edges are sanded/distressed and the piece is antiqued for the final finish. Choice of hanging method and color scheme. A new addition to my new farmhouse line. See other products that we now have. Hand Painted by Heidi.